In continuation of the US effort made for maintaining peace in Afghanistan the special envoy of this country Dr. Zalmay Khalilzad began his third round of tour to Afghanistan and region. But the witnesses say that they are hoping this tour to be a troubleshoot for peace in Afghanistan. In this tour, the special envoy of the US for peace in Afghanistan would also visit other eight countries as well to meet about acceleration of peace process in Afghanistan. Within this tour he would visit Pakistan, Russia, Uzbekistan, Turkmenistan, Belgium, Unite Arab Emirates and Qatar. The US secretary department says the third tour of Khalilzad would begun in December 2nd and would continue till 20th of this month. This department laid emphasize that it wants peace that be worthy for 17 years sacrifices. On the other, the government of Afghanistan says that now, the world support from peace process of Afghanistan has begun and all world nations including the US want to support this process. In the same time, the authorities of High Peace Council of Afghanistan welcoming the US efforts for ensuring peace in Afghanistan, say that they eye to the tour and effort of Khalilzad positively. They laying emphasize that the government and people of Afghanistan welcome anyway to be ended into peace in Afghanistan. Because, our people are tired of war and destruction and are only thirsty of peace in their country. These efforts are made in a time that in a fresh event, the US president, Donald Trump wanted from prime minister of Pakistan to help Afghanistan in peace process. 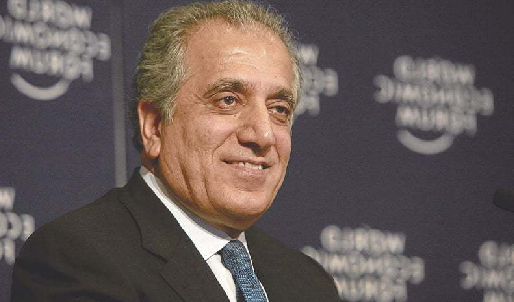 In his second round of his tour Khalilzad had said that he hopes till upcoming month of April, before holding presidential elections, the government of Afghanistan and Taliban to reach an agreement on peace. At the same time, some witnesses in the issue believe that the third round of Khalilzad’s tour for peace has begun in a time that after second round of his tour to Afghanistan and region, no any change has been occurred for peace in the position of government of Afghanistan and Taliban. A expert in political issues, Amir Mohammad in the connection says that despite peace efforts have been increased in national and international level but unfortunately, the Taliban grouping laying emphasize till withdrawal of foreign troops from Afghanistan they will continue to their war and will not be ready for peace negotiations with government of Afghanistan. He said that it is a fact that only the government of Afghanistan has the destiny-making role in peace negotiations and the negotiating side with Taliban is also the government of Afghanistan. So, the US and other countries should have no more expectation from it. This political analyst lays emphasize that till the US not to agree on knowhow of its presence in Afghanistan with other regional players such as Russia and China, Taliban would not become ready for negotiation. Because, with existence of agreement of regional countries, the US would access to a short propagative result but the main problem of war and peace of Afghanistan would not be resolved. Another witness in the affairs, Navid Ilham believes that if Taliban had no support of regional and ultra-regional countries, they never would have the capability and bargaining of war. He added that if Taliban today are insisting on their position, their this position stems from power that behind this power, there are some regional and ultra-regional countries. Ilham continues that with exerting pressure on regional countries the US doesn’t do control the situation in the region but it necessitates that in presence of its troops in Afghanistan beside its interest, this country should also consider the interests of regional countries as well. In connection with the role of neighboring countries in peace negotiations of Afghanistan and their support in this respect, this analyst says that if neighboring countries especially Pakistan help Afghanistan honestly in the process, no doubt, Afghanistan would have access to a durable peace. A number of our compatriots have their own considerations in bringing of peace and negotiation with opponent groupings. They say our people are always in favor of peace and stability in their country. But this peace is maintained in a time that outside interference in our domestic affairs to be cut. One of our citizens, Ahmamd Fawad says that Afghanistan is one of the countries that gave much sacrifices in war on terror and this fight is continuing so far. But, the neighboring countries should help this country. Because maintaining peace in Afghanistan causes peace in the region and in the world. He added that what is a matter of hope for the people of Afghanistan is this that peace efforts would end into a result. So, it is necessary the peace negotiation with opposition should be setforth from a strong position by Afghans themselves so that durable peace be maintained in Afghanistan. This is in a time that Dr. Khalilzad who is a senior diplomat of the US and so far he led difficult missions in the region and Afghanistan, some hopes are pinned the third round of his tour in the region could be a glad-tiding for ensuring of peace and ending of war in Afghanistan.